Bio-25 is an innovative formula containing 11 different strains of unique probiotic bacteria and over 25 billion active bacteria in each capsule. Contains 11 different strains of probiotic bacteria mostly frequently used in probiotic research. The bacteria contained in this formula are unique/patent bacteria, which have undergone double microcapsulation of fibers and protein, and thus particularly resistant to high gastric juice acidity, thus ensuring survival and growth in the intestine, to achieve optimal effectiveness. Bio-25 formula is designed to alleviate various digestive disorders and mainly those who suffer from inflammatory bowel diseases (Crohn's Disease, Colitis), and from Irritable Bowel Syndrome (IBS). Ingesting Bio-25 on a daily basis and for a prolonged period will alleviate digestive disorders such as: diarrhea, constipation, gas, swollenness, and stomach aches, and will also bolster the immune system and alleviate different allergic conditions. There are numerous strains of probiotic bacteria. Bio-25 contains 11 of the most frequently studied strains, with proven capacity for growth in the intestine. Promotes the digestion and absorption of nutrients from food, prevents allergies as a result of malfunctioning digestive system, promotes synthesis of the different types of Vitamin B and Vitamin K and combats pathogenic bacteria and candida; additionally, it is effective in treating colitis and alleviates symptoms of defective digestion such as: constipation, flatulence and swollen stomach. Bolsters the immune system and in turn proves effective in treating various allergies; prevents side effects resulting from antibiotics, promotes synthesis of the different types of Vitamin B, thus assisting in their absorption from food, and alleviates digestive problems and diarrhea. Prevents the growth of pathogens in the intestine, promotes the digestion of milk sugar (lactose) thus alleviating digestion of milk products, contributes to protein break down more than any other probiotic bacteria, promotes the strengthening of the immune system, alleviates allergies, and promotes white blood cell activity (phagocytes). Reduces inflammatory intestinal processes and alleviates typical symptoms of Irritable Bowel Syndrome (IBS), assists in treating viruses that impair the functioning of the digestive system, such as the Rotavirus, prevents diarrhea, fungal infections and yeast infections. Widely used in food and mainly serves to produce milk products such as butter and cheese; inhibits growth of harmful bacteria and fungi by producing pseudo antibiotic ingredients called bactericides. Promotes the breakdown of the milk protein casein, hence its name; reinforces body's immune defense system, inhibits growth of H. Pylori bacteria and E. Coli bacteria, helps reduce symptoms of Crohn's disease, promotes the synthesis of different types of Vitamin B and Vitamin K, and prevents damage caused by nitrates contained in different foods (pickles, smoked products). 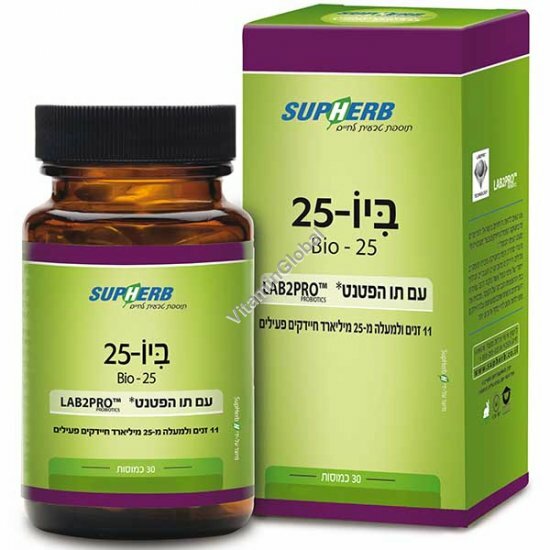 Produces a complex that serves as a natural antibiotic substance called "lactobrevin", responsible for producing the lactosidase (b-galactosidase (מופיע בספרות גם כ-enzyme, which promotes the maintenance of regularly functioning intestinal microflora and prevents the growth Gram-positive pathogens, which may cause diarrhea; stimulates the production of IgA antigens in the intestinal mucous membrane, thereby reinforcing digestive system activity. Similarly, it has been found to alleviate Irritable Bowel Syndrome (IBS) symptoms. Promotes milk digestion by breaking down milk sugar - lactose, thereby alleviating typical symptoms of lactose intolerance, prevents the growth of bacteria and unicellular parasites such as E. Coli, Salmonella, and Shigella, promotes the production of cytokines that assist in regulating immune system activity and alleviates diarrhea resulting from Rotavirus infection in babies. Plays a significant role in promoting the growth of pathogens in the intestine, assists in alleviating symptoms of chronic diarrhea and vomiting and prevents side effects of antibiotics. Promotes synthesis of different types of Vitamin B, alleviates intestinal inflammations, prevents the E. Coli bacteria (Escherichia coli( from sticking to the intestinal walls, reinforces the immune system and prevents the growth of pathogens of the respiratory system. Promotes intestinal rehabilitation, produces vast amounts of lactic acid which help protect against pathogens, and alleviates irritable Bowel Syndrome symptoms (swollenness, flatulence, stomach pains, constipation, and diarrhea). Vegetarians are known for their high quantity of this probiotic bacterium, thanks to their vegetarian diet. This strain of bacteria may be found in plants, fruits and vegetables; it is essential for producing hydrogen peroxide which is important for treating diarrhea and digestive disorders resulting from fungal infection (candida). L. acidophilus, B. bifidum, L. Rhamnosus, L. Lactis, L. Casei, B. Breve, S. Thermophilus, B. Longum, L. Paracasei, L. Plantarum, B. Infantis.